It was over four years ago when I discovered that Sun was using my software, Roller, to power blogs.sun.com. I was thrilled to go to work for the company back in 2004 and what an awesome cast of characters I've gotten to work with over the years. I really enjoyed the folks I worked with on the blogs.sun.com team, the open source folks and most recently, the Glassfish team -- some of the most talented and nicest folks I've ever worked with. It's been a great four and a half years but all good things must come to an end and today is the day. I've been swept up in the latest round of Sun layoffs. Sun has decided to disinvest in Project SocialSite and as of today I'm free and available for employment. Though I do feel some urgency due to the bad economy, Sun's layoff package is pretty good and so I have some time to figure out what comes next and no need to make hasty decisions. Whatever I end up doing, I'll be blogging it here. Oh, and about Apache Roller and Project SocialSite? I'm not ready to give up just yet. I'll be using a little of my time to do some mentoring and to move forward plans for Roller 5.0 this spring. And I see real value in the Project SocialSite "social-enable existing web sites" concept and I'm considering ways to move that forward as well, with or without Sun. I'm still giving my talk Shindig for Blogs & Wikis in March 2009 and, actually, I'm pretty happy I have some time right now to focus on those demos and slides. If you want to learn more about SocialSite, here's your chance. I'll be doing a SocialSite webinar tomorrow (Thursday, Oct. 9) at 11:15am PT. Here's the summary. Project SocialSite is taking a new approach to social networking. Instead of replacing your existing web site with a Social Networking system, SocialSite allows you make your existing blogs, wikis, forums and portals social and all backed by the same Social Graph of users. It doesn't matter whether your existing applications are Java, Ruby, PHP or blog/CMS template driven, you can easily add the SocialSite Widgets and and give your users a complete Social Networking experience right in the pages of your existing site. You'll be able to provide Personal Profile and Group Profile pages, a Dashboard for your users to manage their groups and connections and allow your users to install standard OpenSocial Gadgets that operate against their network of friends. 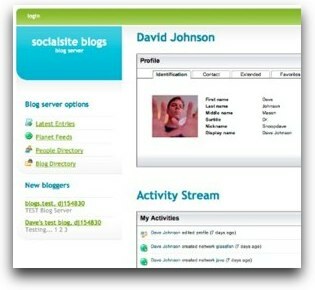 Your applications can manage the social graph via the SocialSite web services and via standard OpenSocial Gadget technology. In this webinar we'll explain the reasoning behind Project SocialSite, the basics of OpenSocial and what SocialSite adds, the SocialSite architecture and its Widgets and Web Services. You can find the dial-in details on wikis.sun.com. I'm just gonna steal this straight from Simon's blog 'cause I'm lazy. Simon Phipps: I got the chance to speak with Dave Johnson last week and catch up on his work building Project SocialSite, a social graph framework exposed as widgets and web services for use by websites wanting to build collaborative communities. Both technically interesting and destined to be an important part of the social media scene, I'll be looking forward to seeing SocialSite in action. Looks like we made it to the final round of the Enterprise 2.0 LaunchPad competition and so Project SocialSite will be one of the five projects that will "present their ideas in front of an audience of creators, evangelists and adopters of cutting edge technologies who will provide feedback in real-time and decide the winner." Thanks to all who voted for SocialSite. And in other news, Arun Gupta has put together a very nice ten minute screencast that shows Project SocialSite in action.